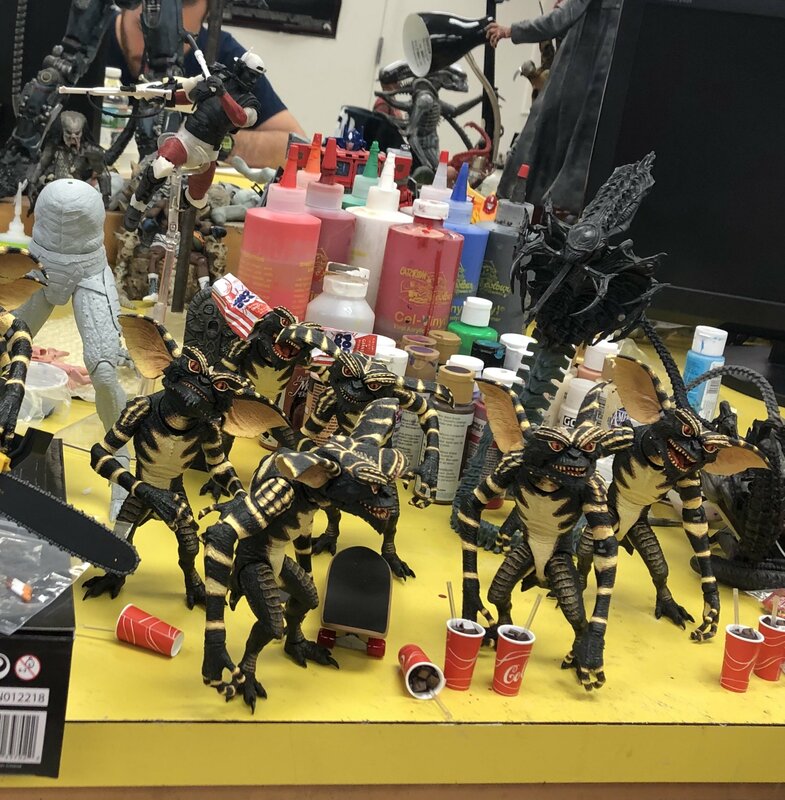 With San Diego Comic-Con 2018 fast approaching, NECA has shared a fun photo showcasing a few of the prototypes and figures heading to the show. 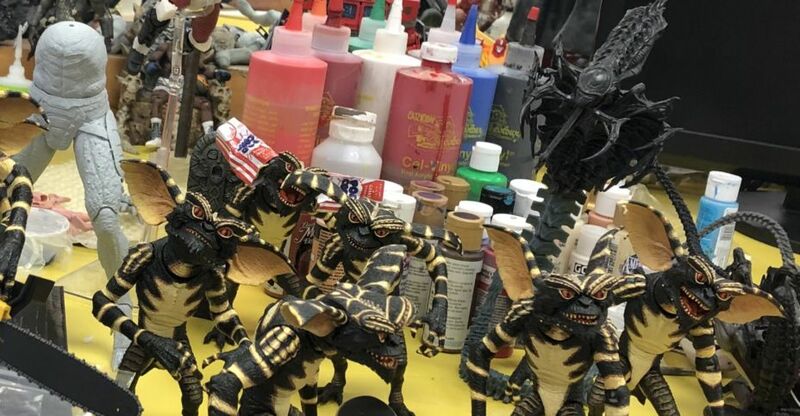 The pics gives a great look at the Ultimate Gremlins Figure, a peek at the protos for Aliens Series 13, and more. Click the banner image to check it out. $20-$25 each... and I need enough to make a movie theater diorama... hmmmmm.... this is gonna be expensive! I need that snake alien. Still need the mantis to go with him too. Those were some of my favorite toys as a kid. Do my eyes see the lower body of the Upgrade Predator from the next movie? He big! Can't wait to see the final production images of the upgrade predator! I'm already so psyched for the movie. I can't wait to see what weapons this Predator will have. I also hope there are more Oredators I. The movie we haven't seen. On the Ultimate Gremlins front I was thinking about getting only two but now I know I'll have to get between 4-6! This is a very exciting time to be a NECA collector for sure! oh...a Snake Alien. Next Kenner Remake Figure. Waitasec...is that the unmasked Wolf Predator I see in the background/upper left-hand side of the pic? *EDIT* If you open the image in a new tab, it's actually much larger...once I did that, I got a better look. The head looks like Wolf (maybe...?) but that looks like a Jungle Hunter body. Not sure. I think I spy POTP Evolution Optimus Prime and Hot Rod in that picture! Cool! I thought that was the Elder Predator, but after blowing it up, it looks like his left arm is fully armoured, maybe? There's also a red figure in the back next to a xenomorph that looks interesting. But, my favourite bit is Ali sitting in the throne for some shut eye after decapitating Michaelangelo. I think it is just one of their Greyback figures, it's definitely not Wolf. As for the red figure I'm not sure if you refer to the Freddy or what appears to be the red Dog alien from the two pack. That's what I love about NECA posting these behind the scenes pics, we all get to go nuts scanning them for clues and gags. Who's the character with the backwards baseball cap? Yeah, it looks like it could be a dog xeno, but it's standing straight up and seems to have a much more human head. We're talking about the figure behind the Big Chap Alien, yes? I'm pretty sure that's a Freddy Krueger there, you can just make out the back tip of his fedora at the end of the back of Big Chap's head and there does seem to be some green at the very top of the shoulder area. I'm referring to the red tail in front of the Big Chap as being the red dog alien from that two-pack. Good call, man. For some reason, I had it stuck in my dome that the tail was part of that figure. Totally missed the fedora. the 12 year old skater kid in me says, yes please. we're finally getting ear articulation on a gremlin! will it come with the chainsaw one is holding just off camera to the left? The chainsaw and skateboard will come with Stripe, among other things. The regular ultimate Gremlin will have all of the food items. It would be nice to see them revisit Gremlins 2 in more depth, they recently got around to Mohawk after years of waiting. While I prefer the first movie Gremlins 2 was still a lot of fun.